Fine Art at Nepean Arts and Design Centre: 12 Week Extended Drawing Program: Enrol Now! 12 Week Extended Drawing Program: Enrol Now! 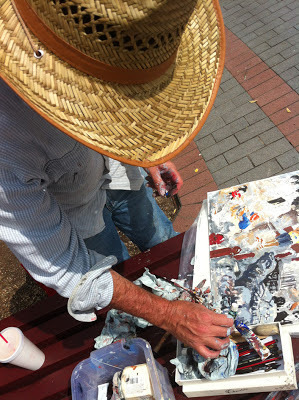 Artist, Stephen Hall, working plein air, 2012. We are pleased to offer a new 12 week specialised drawing course. The teachers of the course are professional artists who will give insights into their own drawing techniques and working processes. The artists, Stephen Hall, Di Holdsworth and Catherine O’Donnell will each teach a 4 week block offering an exciting program that will cover a wide range of drawing techniques and ideas. You may enrol in this course independently of other studies or as an enrichment activity for the Diploma or Advanced Diploma of Visual Arts. Stephen Hall’s work has been exhibited in major exhibitions such as The Dobell Prize for Drawing, The Blake Prize and Sculpture by the Sea and is included in the AGNSW collection. Di Holdsworth has exhibited her work widely in commercial and regional galleries and is represented by the Damien Minton Gallery, Sydney. She has taught drawing at TAFE and University over the past 24 years. For more information phone Tim Allen on 9208 9502, customer service on or 131 870.